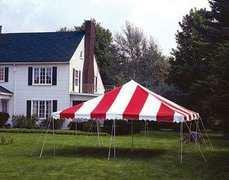 A 15'x15' Pole Canopy is perfect for small gatherings of between 15-24 guests. We recommend a the use of (4) 6' banquet tables or (4) 48" round tables seating a maximum of 24 guests. We recommend 1-2 sets of globe lights to light this size tent. Globe lights may be found under the "Tent Accessoreis" catagory. A 20'x20' Pole Canopy is perfect for small-medium gatherings of between 25-48 guests. We recommend a the use of (4-6) 8' banquet tables seating 32-48 guests or (4) 60" round tables seating a maximum of 32 guests. A 20'x30' Pole Canopy is perfect for medium-large gatherings of between 48-64 guests. We recommend a the use of (6-8) 8' banquet tables seating 48-64 guests or (6) 60" round tables seating a maximum of 48 guests. 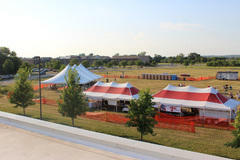 A 20'x40' Pole Canopy is perfect for medium-large gatherings of between 64-80 guests. We recommend a the use of (8-10) 8' banquet tables seating 64-80 guests or (8) 60" round tables seating a maximum of 64 guests.